Andrew has written a number of books over the last 20 years. His books Peat Smoke and Spirit: a Portrait of Islay and its Whiskies and The New France both received great critical acclaim. The New France is no longer in print, but used copies are available from the usual sources. Peat Smoke and Spirit is still in print, as a paperback. 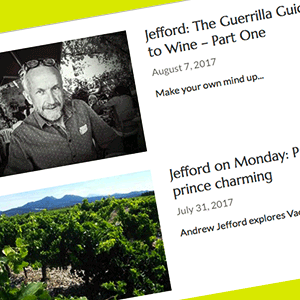 Andrew Jefford’s Wine Course was published in 2008. It is a friendly, accessible and easy-going introduction to wine for those who know little or nothing about it. The Wine Course is divided up into twenty different projects under three main headings: The Tools, The Elements and The Journey. The aim is provide those reading it with a framework for further discoveries, and the confidence to explore.